Welcome to the first in a series of Trade Allowance Management blogs. In this blog, I will be discussing required and optional setup for Trade Allowance Management agreements. 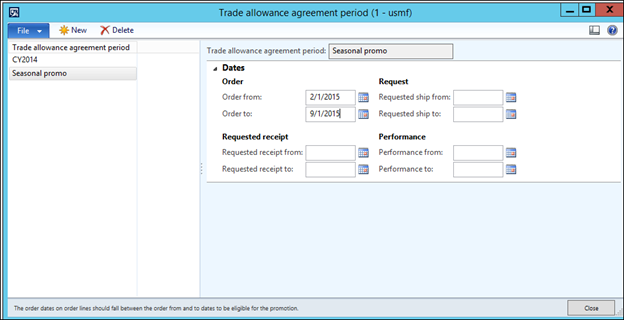 You can use the Trade allowance management module to manage discounts that are offered by vendors to distributors, wholesalers, and retail customers. 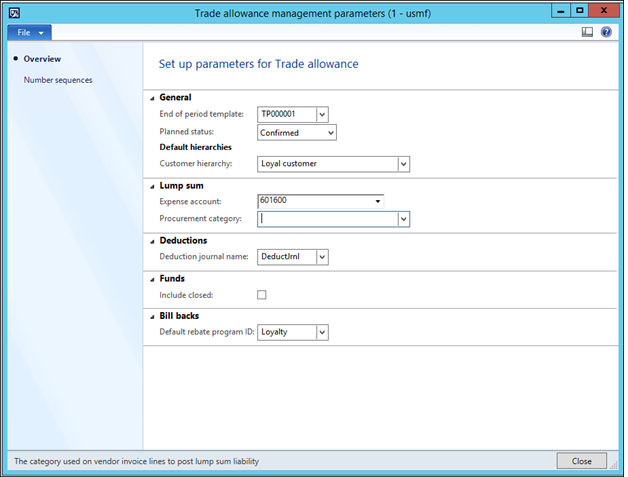 You can use Trade allowance management to create, maintain, and quickly determine the status of trade allowances. Trade incentives include bill backs, off invoice and lump sum incentives, which allow you to make agreements with your customers to help increase sales or meet a specific marketing objective. End of period template: Select the template to apply to automatically generate an end-of-period promotion from the Deduction workbench. Planned status: Select the status that must be applied to a promotion before it can be included in the analysis of planned promotion amounts. 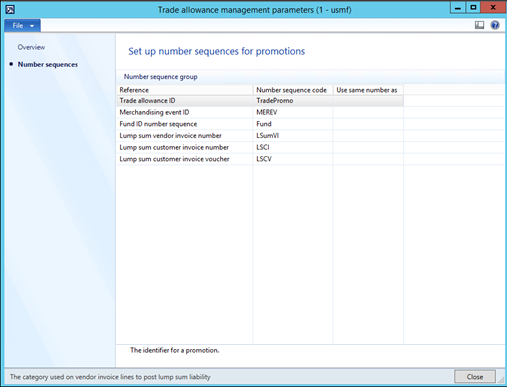 Customer hierarchy: Select the customer hierarchy group to assign to all new promotions. When a new promotion is created, the customer hierarchy can be changed. Expense account: Define the default main account from which the lump sum payments are provided. Expenses that are related to a lump sum are tracked in this account after the lump sum is paid. Procurement category: Define the default procurement category to use when a lump sum is paid to a vendor. The category that the payment is posted against determines the expense account from which the payment is taken. Deduction journal name: The journal name selected will be used for matching, denying, and writing off deductions. You must define the journal name in the general ledger module before it can be selected here. Include closed: The checkbox can be selected to include funds with the status of closed when analyzing funds. Default rebate program ID: assign the default rebate program ID that is automatically assigned to all promotions or marketing activities that include rebates. The default rebate program ID is a template that defines which main accounts are used when posting the expense and liability of a bill-back claim. Merchandising event categories are used on the trade allowance line. Their purpose is to compare similar types of promotions during the analysis phase. 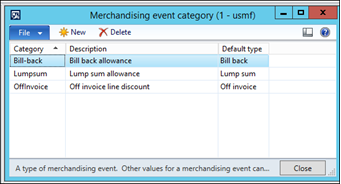 Bill-back: Bill-back merchandising events are used for trade allowances where reimbursement is given after purchase. Lump sum: Lump sum promotions are larger amounts of payment delivered after a service is completed. Off-invoice: Off-invoice merchandising events are taken at the time of order and automatically deducted before the customer makes a payment. No reimbursement is necessary. Rebate: This rebate type is typically processed by sending a check to the customer or by deducting the rebate amount from the customer’s invoice. Freight: Freight rebates accrue based on region and are not passed to the customer. They are used only for reporting. TMA: Trade & Merchandising Allowance (TMA) rebates accrue until they are passed on to the customer, which is usually by credit note. Bill back: Refund of a payment that a customer previously paid for an item or service. A customer can use a rebate as a deduction on an outstanding balance or take the amount of the rebate as a credit. Eligible customers and products are distinguished through category hierarchies. You can use customer category hierarchies to group customers that have similar characteristics, such as region or line of business. Before you can add a customer to a fund, trade allowance agreement, or trade allowance template, you must create customer category hierarchies and add customers to those hierarchies. Each trade allowance requires at least one product and one customer. To manage customers on the hierarchy, click the add/remove customer button. 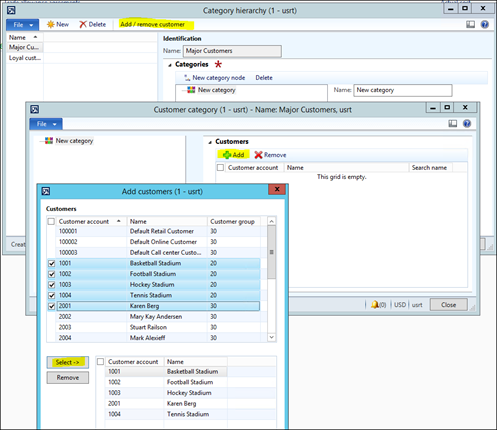 Product categories are set up in product information management > Setup > Categories > Category hierarchies. Trade allowances may be negotiated in order to meet different goals. Marketing objectives can be created and then entered on the trade allowance to provide an explanation of the promotions and sales that are offered by your organization. Trade allowance agreement periods are used as a time frame that identifies the date ranges that need to be met to qualify for the trade allowance. A range is defined for order dates, requested dates, requested receipt dates, and performance dates. Trade allowance agreement periods are not required but help to streamline trade allowance setup. Trade allowance periods can be set up to use solely for reporting purposes. Funds define an amount of money which can be allocated for trade allowances. Funds setup defines not only the budgeted amount, but also the eligible time period, customers, and items. Funds can be distributed among various trade allowances. Funds can be set up to use solely for reporting purposes. Fund Usage Records can be set up to categorize reasons for using funds for trade allowance. Enter the name of the cost center that is providing the funds and then enter a brief description of the cost center. Discretionary: The fund can be used as needed. Fund budgeted: Maximum amount for the fund. Usage: Cost center that provides the fund. Hierarchy: Select a Customer Hierarchy (this was discussed earlier). 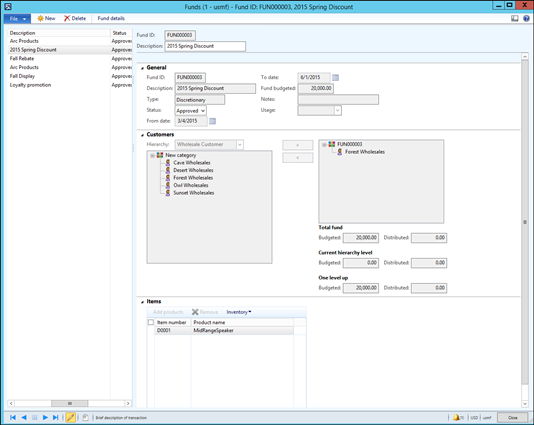 You can insert all the customers in the Hierarchy or specific customers. Click Add products. In the Add products window you can select the product Hierarchy and insert from the Available products section. This concludes the required and optional setup for a Trade Allowance Agreement.